You can look both the 2010 Scientific Program and the abstracts up in the Abstracts Book by means of the link to the left. An all inclusive conference from 490€!! All participants must register and pay the following Conference Fee, A) and B). a) If you register before April 30th, 2010 you will reduce 100€. b)	If you are student, retired, Gasca's academic descendant, organizer of a mini-symposium or present a talk/poster you will reduce 100€. i. 100€ if you were referee for the Jaen Journal on Approximation in the last two years or you plan to submit a manuscript to Jaen Journal on Approximation in the next two years not necessarily related to your talk/poster. ii. 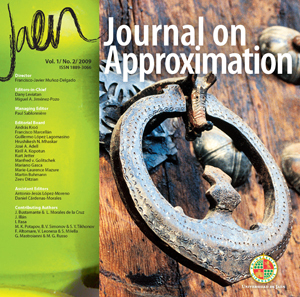 50€ if you (or your Institution) are (is) subscriber of the Jaen Journal on Approximation. Discounts a), b) and c) are accumulative then you could pay 0€ for A). The registration fees must be paid at the registration desk once in Úbeda. If you prefer to pay the registration fees in advance contact with us. i.	Accommodation*: single room in a well located hotel (5 nights, details below). ii. Meals: breakfasts (from 5th to 9th ), lunches (from 4th to 9th ), dinners (from 4th to 8th , including special Gala dinner and Flamenco dinner). * Two participants who agree to share a double room will reduce 100€ each (final price: 490€ per person). Hotel reservation must be done by payment of 200€ per requested room to Hotel María de Molina. The rest of B) will be paid once in Ubeda at the registration desk in cash or by credit card. Accompanying people must pay only for B), accommodation, meals, local travels and social events. If you plan to participate and pay 590€ for B), you can attend the conference with an accompanying person sharing a double room with an additional payment of 390€. Please contact if your situation differs from the previous ones.